Russian political economist; born at Odessa 1865. While a student he joined the Jewish nationalists of Odessa, and lectured at the Sabbath free school of Löw and Sussman. For his treatise "Zalog po Rimskomu Pravu," he was honored with a gold medal. Graduating from the university in 1889, a proposition for a pro fessorship was made to him, but as one of the conditions was that he embrace Christianity, he declined the offer. Four years later he was invited to lecture at the University of Sofia, Bulgaria, on political economy and the history of Roman law. At Sofia he published (in the Bulgarian language) his "History of the Roman Law," 1895; "Political Economy," 1896; "Exchange in Bulgaria," 1895; and "Credit and Banking in Bulgaria," in vols. xv., xvi., and xvii. of the magazine of the Ministry of Public Instruction. 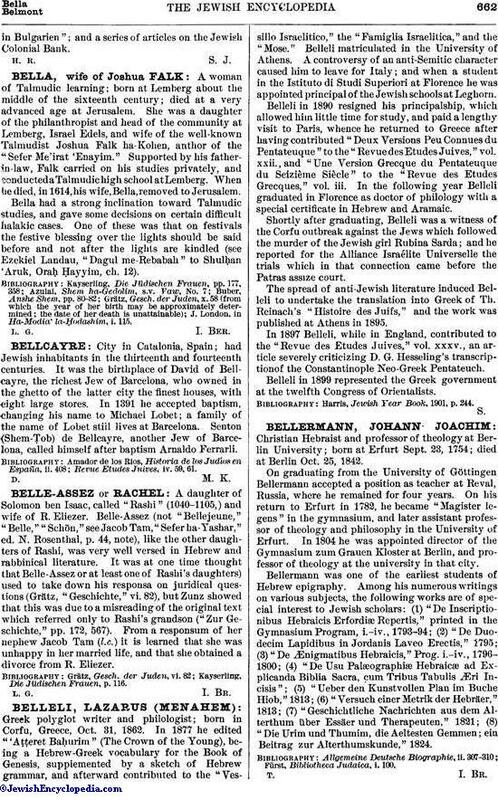 At this time Belkovsky became active in the spread of Zionism, and published "Appel an das Judenthum und Seine Getreuen Söhne" (anonymous, Sofia, 1897, in German, French, Hebrew, and Spanish). He has been a prominent supporter of the Zionist movement, and since 1899 one of the Russian representatives in the larger "Actions-Committee." In 1897 Belkovsky returned to St. Petersburg, where he still lives (1902), and continues his propaganda of Zionism. Besides the above-named works he contributed articles on agriculture, political economy, and industrial subjects to the "Entziklopedicheski Slovar" of Brockhaus and Efron, to the "Sudebnaya Gazeta," and other periodicals. 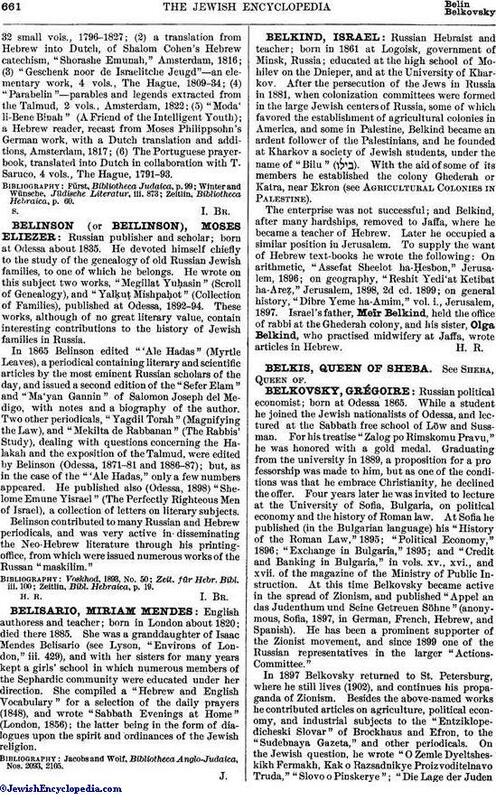 On the Jewish question, he wrote "O Zemle Dyeltsheskikh Fermakh, Kak o Razsadnikye Proizvoditelnavo Truda," "Slovo o Pinskerye"; "Die Lage der Judenin Bulgarien"; and a series of articles on the Jewish Colonial Bank.